lets see wether I can write a half-way not confused post. I am a computer science student at the Technical University Dresden. I followed LD21 with great excitement. The idea to just create something and not try to make it perfect – to have an excuse for it, is awesome. I am super excited that some hundred people around the globe join together to code and design just for fun. I love playing your LD games. It’s the best kind of entertainment and far more innovative and lovely than the usual games. I love the idea to have a coding crunch and create something myself. So a friend encouraged me to take part. And Thursday night I decided to do just that. I moved all my appointments out of the way and prepared for an hour by creating a scratch Qt project and added a mainloop and some moving boxes. I have not created a game (or game-like thing) in about 8 years. A blast! I quickly had a sense of what I was trying to create, and just began coding. I wrote a lot of boiler plate code the first day. 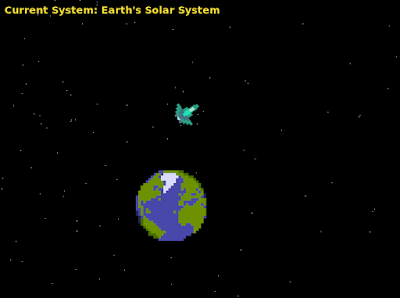 Input, game states, scrolling text, a moving spaceship, a moving background and all that shananiganry. It was really fun and went surprisingly smooth (taking math courses pays off!). On the second day I added the things that make it a bit more like a game, like animations, pictures, levels, a start and an end. Right now there is nothing to do in the game but wait for the end to arrive at you (so to say). A star map would guide you. I was not sure what to do while being inside the solar system and flying to the wormhole. So I left that out to come back to it later. Perhaps evading some asteroids or I don’t know. Anyways, I am tired and the timing would be pretty close in the end. So I’ll just leave it at that, and be happy that I created something cool (although it is very unfinished) and took the chance to hone my skills for some hours. Created on Linux, and probably doesn't work out of the box on windows. Uses SFML 1.6 and Qt 4.7.